24: Tired With The Feeling Of Hopelessness. You have been wonderful through this–the most loyal, comforting, heartwarming mother & sister a boy ever had. I love you both for what you have done and said–for the love that you have borne for me. How do I feel? Older, and tired in some deep, strange way. Tired, not from the exhaustion of having done too much, but tired with the feeling of hopelessness, believing in my heart that I have done everything that was humanly possible, and seen it all fail. Something drops out inside you when you have wanted some one thing for six years–it has been the one aim of your days, the spur that lay behind every effort, then at last have it promised you, then denied at the last minute. Oh you know, your letters tell me that, I don’t have to tell you. As you know now, my last letter glassed the whole thing over for you–I still thought–believed with all my heart that Anne would have to courage to summon up her strength and come to me again. That of course is what hurts the most–I could and did forgive the turning back at Los Angeles, if only because she is frail and her father strong, but she should have come back to me. I pleaded with her through 62 pages of impassioned letters, abased myself, took all the blame for having trusted in just one telegram to have reached them–I tried frantically for two days to get airplane passage out until Mr. Davis told me not to come. You see their wire telling me to meet them in LA was delivered to the wrong Wood, and I didn’t get it until it was too late to make a train up there–and my wire to them telling them to come on to Oceanside never reached them–I didn’t know that until 48 hours later–going mad with worry–when I found out that they had stayed in LA five hours, then turned around and gone back, not having tried to phone me or wire. Now I think that that shows lack of faith in me, lack of strength in herself, but then I didn’t care–I sent six wires to the train, none of which got there–then started the phone calls. She wasn’t mad at me, that would have been something, but only heartbroken at the “Fate” which had kept us apart. Then many letters including the enclosed from Fate, which I do want back–for my memory book–and Rusty said that she wasn’t able to come right away, sick, exhausted, sedatives, etc.–and he had a big trial coming up, couldn’t get away, and she wouldn’t come without him. The last was one of the hardest of all to take. Then came the announcement which I don’t think you should have done Mother–although it was my fault for not letting you know–you see I still believed and I didn’t want to tell this story if it could be helped–I knew how you would feel. Mr. Davis called me–told me about it and said that he wanted me to understand that marriage was out of the question now, or rather “at this time”–and that I was to stop writing Anne to come on & marry me–they only upset her–told me that he thought that I had blundered the whole thing and more of the same–I said nothing. Then Friday night Rusty called–both of them very excited about the announcement, which bothered me not at all. A very nice half hour call, helping on a lot of things, except that I told her that if she expected to maintain relations with you Mother, that she ought to write and explain–she said that she didn’t think it her place to write first, said something about pride–I asked what pride had to do with a situation like this–didn’t argue but just told her what the effect would be. This all sounds pretty harsh, and it is. Rusty’s actions have been hard to take–but every day she has poured forth from her pen an immense love, the one I’m sending is the only one I could spare, the most mundane & practical. We are in love–and always will be. If I can say that after all this, I think you can see what I mean. This has made a wound which may never heal–I have been deeply hurt by what I can only take as a lack of faith in me, and even more deeply hurt by Anne’s unwillingness to make a sacrifice for our marriage–it would be a big one for her, coming out without her father, but I will never understand how anything could be so great as to bar this, the final happiness. And before me always is the knowledge of what you and Daddy would have done, Gretchen–and what Mother has done. Some day, after the war, and when Rusty is mature enough, we will probably marry. I say probably–I can’t help having a few little doubts after this–but this whole thing has taken some of the fire from my love–that is the greatest tragedy of it–some day that portion may be rekindled, but it has to come from some action of Anne’s. I’ve got to be shown–I want passionately to be shows–I long for the beauty and faith that we knew–that sincerity and deep trust that we had for so long—the belief in each other that made us lovers. I need that to live again. This announcement appeared in the New York Times–as it turned out, somewhat prematurely. Margaretta apparently acted of her own accord in running the notice. The end of Phil and Rusty’s relationship was not as widely broadcast–more than a year later, members of Phil’s extended family were surprised to learn that the marriage had not occurred. Date unknown, but evidently some time after the previous missive given the amount of correspondence reported between Phil, Rusty, and the disapproving Mr. Davis. The communication mix-up was only part of the problem; Phil also reportedly drew duty as Officer of the Day, which would have restricted him to camp anyway. 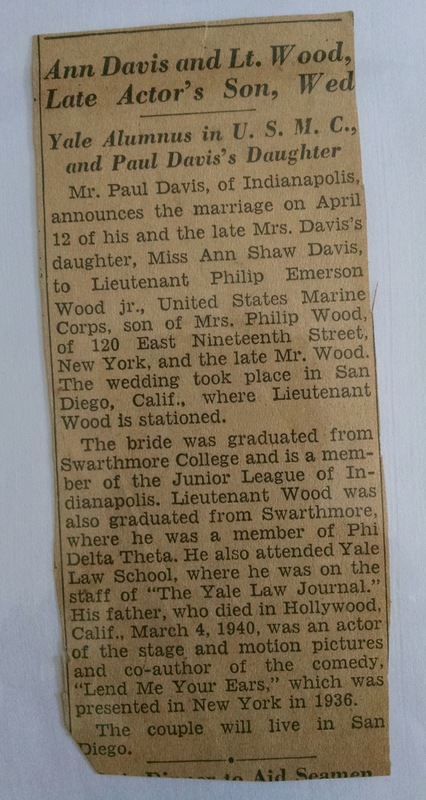 Not knowing of these late developments, Margaretta Wood ran a newspaper announcement of the wedding–a clipping of which was saved with this letter. Pride or no pride, Anne Davis did eventually reconnect with the Wood family, and corresponded with them for nearly seventy years. The enclosed letter referenced here was evidently returned to Phil Wood, and has not survived.